Brilliantly twisty thriller with a fantastic finale! First Lisa, then Sam and finally Quincy are the sole survivors at three separate mass murder scenes. The press starts calling them final girls, which is a horror movie term for the last survivor. Quincy has tried to forget her horrible night at Pine Cottage, where all of her friends are killed. She and her long-time live-in boyfriend are talking marriage, She has a successful baking blog. But then Lisa dies by slitting her wrists after sending Quincy a cryptic email. Has a serial killer decided to target the final girls? Can Quincy’s boyfriend or the cop who saved her year’s ago save her? Final Girls has the most convoluted plot I’ve seen this year. Though many books’ jackets claim to be the next Gone Girl, I believe this book really deserves the comparison. The plot synopsis above is probably only a tenth of the entire plot. I had read that this book had a surprise at the end. That is a huge understatement. I suspected anyone and everyone of being the villain and still did not see the end coming. The book’s effect is like riding a roller coaster: Final Girls is that good! 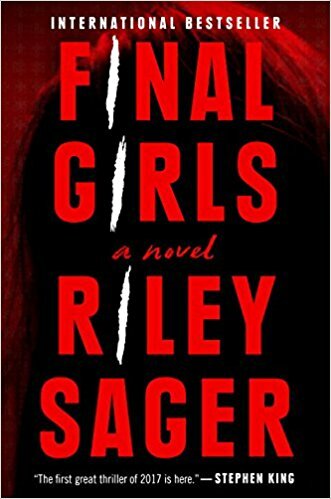 Final Girls’ whipsaw pace and compelling plot makes this novel highly recommended not just for thriller fans but for anyone looking for an exciting read. Be prepared though for some sleepless nights as the book is extremely difficult to stop reading. 5 stars! Thanks to the publisher, Dutton, and Netgalley for a review copy in exchange for an honest review. It was truly an exceptional book!